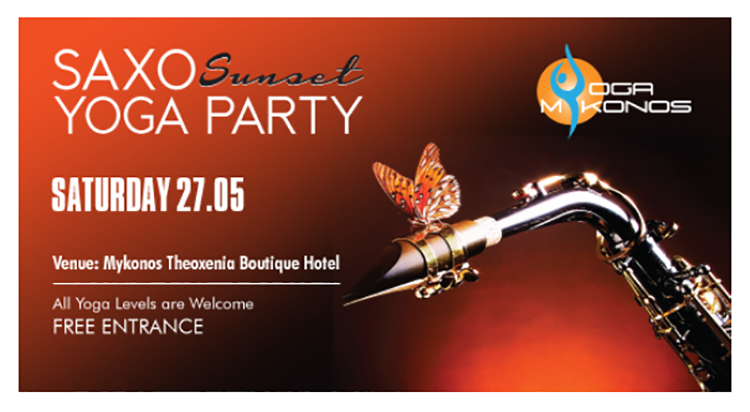 Yoga Mykonos invites all Yoga Lovers to celebrate together with a Breathless Saxo Sunset Yoga Party!! Inhale freedom and peace of mind and heart, through a practice of holding floor poses of 90 min, overlooking a breathtaking view of the island of Delos during the amazing sunset while listening to Saxo played live by Giuseppe Fabris! Release Tension and Stiffness in your hips, legs and spine. Exhale negativity! Class ends on sunset with a guided relaxation and an organic tea that will be offered after practice at the open-air bar of the hotel. All Yoga lovers are welcome..